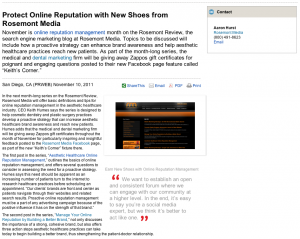 In the next month-long series on the Rosemont Review, Rosemont Media will offer basic definitions and tips for online reputation management in the aesthetic healthcare industry. 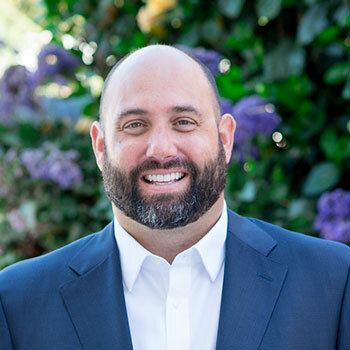 CEO Keith Humes says the series is designed to help cosmetic dentistry and plastic surgery practices develop a proactive strategy that can increase aesthetic healthcare brand awareness and reach new patients. Humes adds that the medical and dental marketing firm will be giving away Zappos gift certificates throughout the month of November for particularly inspiring and insightful feedback posted to the Rosemont Media Facebook page, as part of the new “Keith’s Corner” fixture there. The second post in the series, “Manage Your Online Reputation by Building a Better Brand,” not only discusses the importance of a strong, cohesive brand, but also offers three action steps aesthetic healthcare practices can take today to begin building a better brand, thus strengthening the patient-doctor relationship. The Rosemont Review is the aesthetic healthcare blog of Rosemont Media, an firm concentrating on online advertising and dental and medical website design. As the modern ad agency, Rosemont Media combines a traditional approach to advertising with cutting-edge search engine marketing tools and services to help their aesthetic healthcare clients turn new patients into returning patients, and returning patients into loyal practice advocates. Rosemont Media is located at 1010 Turquoise St., Suite 201, San Diego, CA 92109. The firm can be reached at (800) 491-8623, or found online at rosemontmedia.com or facebook.com/rosemontmedia.